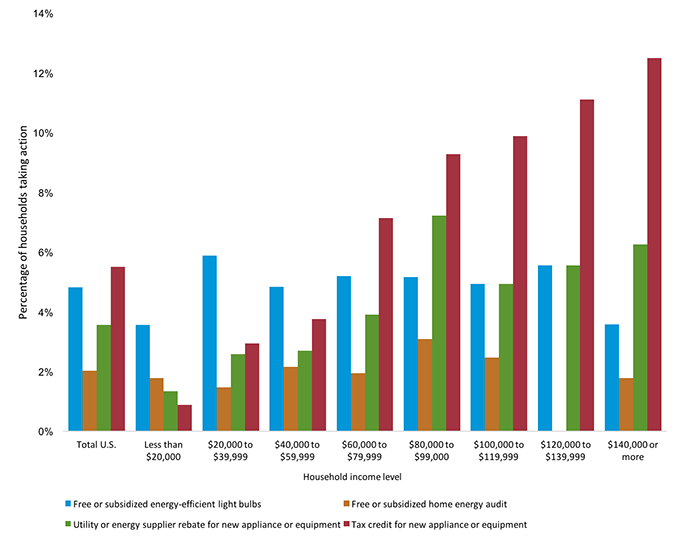 Home > Who Invests in Energy Efficiency and Why? This blog post is the second in a three-post series on understanding and increasing investments by businesses and individuals in energy efficiency. In the first post, we discussed current energy efficiency investments in the United States, which we estimate total about $60-115 billion per year. This number includes investments driven by policy, private market investments, and a mix of the two. In this post, we explore who invests in energy efficiency and why, focusing on mainstream businesses and consumers. The third and final post builds on the first two and discusses approaches that could increase efficiency investments in the future. Who Invests in Energy Efficiency? 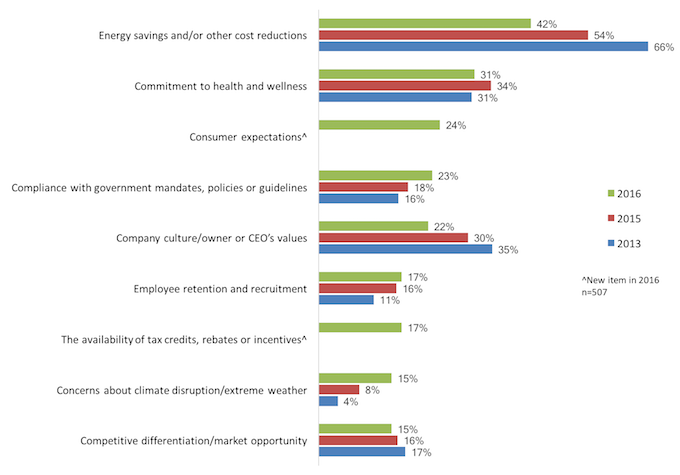 Percent of respondents indicating sustainability/conservation was important or very important when asked ”How important would you say sustainability and/or conservation is to your company or organization as operating, capital improvement, construction and purchasing/supply chain decisions are made?” Source: Shelton Group’s 2016 B2B Pulse survey. Frank and Nowak also found an income effect as well as an education effect among households participating in California utility rebate programs (households with higher levels of education were more likely to participate). Note that income and education are usually highly correlated. The Harvard Joint Center for Housing Studies found, after controlling for age and income, that households that moved within the past three years spent about one-third more on home improvements than otherwise similar non-movers. In a forthcoming ACEEE report, we find more interest in making energy efficiency investments among households with children and homeowners in the 30-34 age bracket relative to younger and older households. Costanzo et al. found that more mundane factors also play an important role, such as home ownership, ownership of home technologies, and the presence of a household member able to perform household repairs. Why Do Businesses Invest in Energy Efficiency? Share of respondents citing each each; respondents could select more than one. 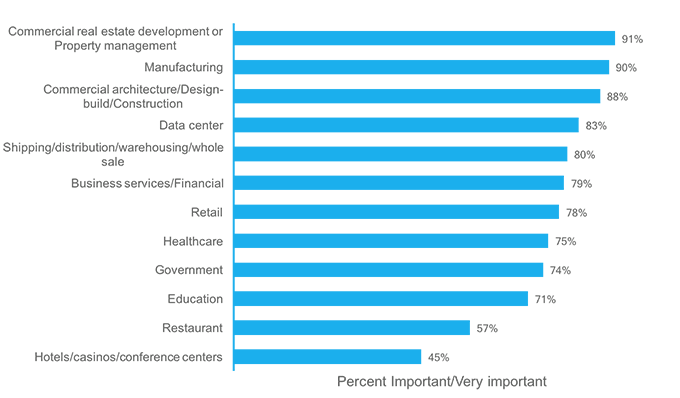 Source: Shelton Group’s 2016 B2B Pulse survey. While not included in this survey, productivity (defined broadly) can also be an important driver. Examples can be found in schools (students do better in classrooms with daylighting), offices (productivity tends to increase as temperature control, indoor air quality, and lighting control improve), and warehouses and factories (energy-saving adjustable speed drivers can reduce mass loss in apple warehouses and can speed lumber drying). In many applications, these productivity benefits can be larger (sometimes substantially larger) than the value of energy savings, as documented in some case studies. Often, multiple rationales apply to a single investment decision, particularly for small firms. When more than 200 German manufacturing firms were asked why they invest in energy efficiency, 57% of large companies said energy efficiency was the primary reason, while 43% said that energy efficiency is a side benefit caused by other investments. For small businesses, the figures were 36% and 64%, respectively, with side benefits predominating. Why Do Households Invest in Energy Efficiency? Top three reasons to participate in energy conservation activities or buy an energy-efficient product/make home improvements. S ource: Shelton Group 2016 Energy Pulse Survey. Financial concerns are both a benefit of and barrier to upgrading. Some evidence (see here and here) suggests that the negative perceptions of upfront costs may outweigh the positive perception of bill savings as the dominant driver of upgrade decisions. Other financial benefits may be harder for consumers to assess. Focusing homeowners on both the financial and non-financial benefits of energy efficiency provides a complete picture of what they can expect to get back from their investment. While some home energy upgrades are not cost-effective or have long payback periods based on utility bill savings alone, they deliver other benefits that can be of great value to consumers. For example, comfort is cited as a top reason for energy efficiency investments in many studies and has the potential to encourage more expensive investments with longer payback periods. Comfort is often underappreciated as a motivating factor because homeowners do not use that term. Instead, they talk about problems with noise, humidity, cold drafts, temperature control, natural light, glare from windows, unwanted heat from windows, and other related issues. Health and environmental sustainability motivations are also underappreciated drivers of energy efficiency investment for similar reasons. This information provides a variety of insights into potential strategies to increase energy efficiency investments in the future. Stay tuned for our next and last blog post in this series to learn more.